In A Story With Pictures the main character is confused as to why the story has started because she doesn’t have her script done. This picture book is written in a very interesting way in a sense that she is talking to the illustrator. She is having a conversation with both the illustrator and the reader throughout the book. Throughout the book she tries to make up her story as the illustrator draws random things, she also says she is the best storyteller ever. One thing I found interesting that I didn’t notice until the second time reading is that some of the pictures are real but they are just cut out and put into a animated background. I thought these illustrations were really cool and different. I think having some real and some animated went well with the text because the book is about random events happening to the narrator.I think a child can relate to this narrator because like most kids who try to be very independent and think they’re the best everything so does this narrator. Although things aren’t going her way she still believes she can tell the best story ever. Like most kids when things don’t go their way they believe they can find away around it. This can also be seen as a lesson given through the book. Like mentioned this book is very random, not even the narrator knows what is going to happen next and I think a story written like this will keep a reader entertained because the reader themselves will want to know what is going to happen next and what the narrator will do next. I think this book is very easy for a child to follow along and stay focused in on. This story starts out by the narrator says she's going to write a great book but she can't think of where to start. As we turn the next page a duck appears and he has a backpack on. The lady writing the story is very confused until she realizes she is in the book! As the scenes go on she pulls out different words out of the backpack like character and setting. She then thinks of what characters she wants to have in her book but she definitely does not want a duck. She then realizes she is stuck in her own story and cannot get out. The story ends with a picture of a typewriter and a rubber duck right next to it saying she decided to write about a duck. I didn't really think this story had a great flow. The text jumped around a lot and it was hard to stay focused on what the author was trying to get across. It was a lithe too silly which made it hard to follow along because their was no real story line. The text was sometimes all over the place which made it hard to decipher what was the beginning of the sentence. I also didn't care for the illustrations in this story. Some of the illustrations were drawn but some of the illustrations were actual pictures which was a little weird. The illustrator decided to put an actual picture of a backpack on the duck. It made the illustrations look a little tacky and made it seem like the illustrator didn't really care how the illustrations turned out. It also made it stick out like a sore thumb and that was the only thing I could focus on which took away from the text in the story. This is the story of an author who gets stuck in her own story. It starts with the author fretting because she hasn't finished writing her story, yet she is somehow in the middle of her story. As the story progresses, she begins to realize that yes, she is in her own story, but that does not mean that she is powerless. She begins to realize that she has power over her story and can control what happens in it. At the end of the story, she realizes that the point of her story was to realize that she can control what happens to her. Although I did like the story, I thought that the illustrations that went along with the story were a little weird. I didn't think that they were very visually appealing, but I can understand that it was a good idea for a mixed media style to be used as it went more with the idea that the book wasn't ready, and there wasn't time for good pictures to get put together. I guess that it would appeal to a child, but as an adult they just weren't pleasing to me. One thing that was done well was the actual story. I thought that it was very creative and a good example of meta fiction. I thought that it had a good message to give to kids that wasn't overpowering or too obvious. The author was an entertaining character and it was fun to follow the story with her. She also gives a really good feeling of closure at the end of the story as well. In this story, the narrator attempts to tell her story, but cannot find the transcript in which she wrote all of her information. She then stumbled upon a duck who proceeds to change the story and take her on a journey throughout the book. In the end, she discovers her transcript which correctly depicts her journey to find her own storyline.I personally had a hard time connecting with these illustrations. I did like that there were real pictures placed into each page, such as the tutu and a rubber duck, but did not have a very strong connection with the illustrations as a whole.However, I did think the storyline itself was rather clever. It was different then anything I had read before and went down a plot I had not been anticipating. Overall, the storyline was clever and witty and I'm happy to have read this book. In this zany book, the author's story is taken over by a duck. Without her story, the author can't make the illustrator draw the right pictures. Anthills, funny hats and baseball mix together before the author gets back control. Your turn to write: Write what happens when the duck steals the story away from the illustrator and the author uses all the wrong words. You could also write about how you made a book. Love the story, really hate the illustrations. Sorry. The illustrator takes over the story and explains to the author (a visual character) the requirements of a plot and story. Entertaining and silly. 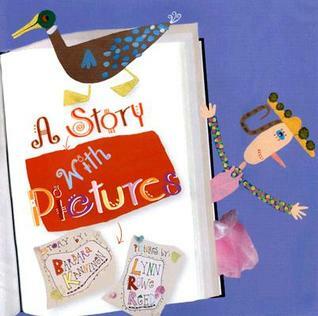 Good quick read-aloud to share with beginning writers to help identify parts of a story. Crazy illustrations made the author realized her manuscript could be a lot more interesting. Fun story! A really funny story about an illustrator who doesn't think she's an illustrator exactly.